For precise control over how you want your Microsoft PowerPoint 2019 presentation to be printed, you must switch to Backstage View and conjure up the Print screen, shown here. To summon this screen, choose Office→ Print or press Ctrl+P. After you call up the Print screen, click the big Print button or press Enter to print all the slides in your presentation. Fiddle around with the settings to print a select group of slides, to print more than one copy, or to print handouts, speaker notes, or an outline. The following sections show you the treasures that lie hidden in this screen. Printing can be es-el-oh-double-ewe, so don’t panic if your presentation doesn’t start printing right away. PowerPoint printouts tend to demand a great deal from the printer, so sometimes the printer has to work for a while before it can produce a finished page. Be patient. The Printer Wizard has every intention of granting your request. The Copies field lets you print more than one copy of your presentation. You can click one of the arrows next to this field to increase or decrease the number of copies, or you can type directly in the field to set the number of copies. Print Current Slide: Prints just the current slide. Before you invoke the Print command, you should move to the slide that you want to print. Then select this option in the Print dialog box and click OK. This option is handy when you make a change to one slide and don’t want to reprint the entire presentation. Custom Range: Lets you type specific slide numbers you want to print. Custom Shows: If you set up one or more custom slide shows, you can use this option to select the show that you want to print. Full Page Slides: Lets you indicate how many slides per page you want to print. You can also use this same drop-down list to print Notes Pages or the outline rather than slides. 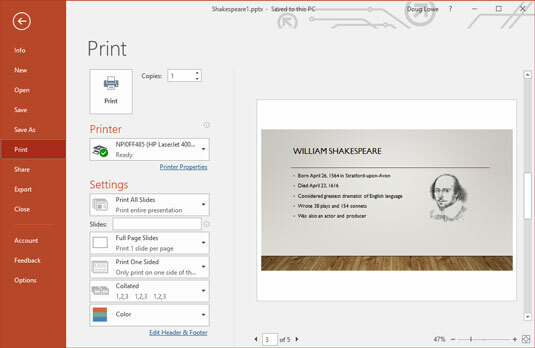 Collated: This option tells PowerPoint to print each copy of your presentation one at a time. In other words, if your presentation consists of ten slides and you select three copies and select the Collate check box, PowerPoint first prints all ten slides of the first copy of the presentation, then all ten slides of the second copy, and then all ten slides of the third copy. If you don’t select the Collate check box, PowerPoint prints three copies of the first slide, followed by three copies of the second slide, followed by three copies of the third slide, and so on. Color: This drop-down list lets you choose whether to print your slides in color, black and white, or with shades of gray. The Print screen of Backstage view includes a Print Preview feature that lets you see how your pages will appear before actually printing them. From the Print screen, you can zoom in to examine the preview more closely by clicking anywhere in the preview area. You can also scroll through the pages by using the scroll bar or the navigation arrows beneath the preview area.